For other uses, see Gribble (disambiguation). A gribble /ˈgɹɪbəl/ (or gribble worm) is any of about 56 species of marine isopod from the family Limnoriidae. They are mostly pale white and small (1–4 millimetres or 0.04–0.16 inches long) crustaceans, although Limnoria stephenseni from subantarctic waters can reach 10 mm (0.4 in). The term "gribble" was originally assigned to the wood-boring species, especially the first species described from Norway by Jens Rathke in 1799, Limnoria lignorum. The Limnoriidae are now known to include seaweed and seagrass borers, as well as wood borers. Those gribbles able to bore into living marine plants are thought to have evolved from a wood (dead plant) boring species. Gribbles bore into wood and plant material for ingestion as food. The cellulose of wood is digested, most likely with the aid of cellulases produced by the gribbles themselves. The most destructive species are Limnoria lignorum, L. tripunctata and L. quadripunctata. Due to dispersal while inhabiting wooden ships, it is uncertain where these three mentioned species originated. Limnoriidae are second only to the Teredinidae in the amount of destruction caused to marine timber structures such as jetties and piers. L. tripunctata is unusually tolerant of creosote, a preservative often used to protect timber piles, due to symbiosis with creosote-degrading bacteria. Gribbles bore the surface layers of wood, unlike the Teredinidae which attack more deeply. Their burrows are 1–2 mm diameter, may be several centimetres long, and have the burrow’s roof punctured with a series of smaller ventilation holes. Attacked wood can become spongy and friable. Gribbles play an ecologically important role, by helping to degrade and recycle driftwood. Most seaweed boring gribbles attack holdfasts and their activities can cause the seaweed to come adrift especially during storms. For defence, gribbles can jam themselves within their burrows using their uropods and block the tunnel with their rear disc-shaped segment, the pleotelson. A number of crustaceans have evolved as commensals with Limnoriidae. 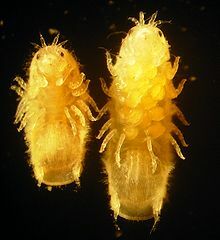 Chelura are amphipods that inhabit the more severely attacked regions of gribble-attacked wood. Donsiella are tiny copepods that inhabit the brood pouch and body of Limnoriidae. It has been suggested that the enzymes used by Limnoriidae to break down wood may be useful for producing sugar from non-food biomass, such as wood or straw, in a sustainable way. This could then be used to produce alternative fuels. "Enzymes produced by the tiny creatures are able to break down woody cellulose and turn it into energy-rich sugars meaning that gribble could convert wood and straw into liquid biofuel." One particular enzyme produced in a special organ in the body of the gribble called the hepatopancreas and secreted into its gut has recently been identified and characterized: the GH7 cellobiohydrolase, LqCel7B. This enzyme has been shown to be highly effective in a salty environment such as that in which the gribble lives. ^ WoRMS (2011). Schotte M, Boyko CB, Bruce NL, Poore GC, Taiti S, Wilson GD, eds. "Limnoriidae". World Marine, Freshwater and Terrestrial Isopod Crustaceans database. World Register of Marine Species. Retrieved December 1, 2011. ^ "Sailors' historic scourge may hold the key to bioenergy future". University of York. January 27, 2009. ^ "'Gribble' marine pest may be key to biofuel breakthrough, say scientists". The Times. March 9, 2010. R. J. Menzies. The marine borer family Limnoriidae (Crustacea, Isopoda). Bulletin of Marine Science of the Gulf and Caribbean. 1957 7: 101–200. L. J. Cookson. Australasian species of the Limnoriidae (Crustacea: Isopoda). Memoirs of the Museum of Victoria 1991 52: 137–262. L. J. Cookson and G. C. B. Poore. New species of Lynseia and transfer of the genus to Limnoriidae (Crustacea: Isopoda). Memoirs of the Museum of Victoria 1994 54: 179–189. This page was last edited on 24 November 2018, at 16:45 (UTC).